5793 labyrinths found. Showing 1-20. Sorted by country, state, city, then zip/postal code. Angelgate Universal Labyrinth, on Angelgate Island, exists in secondlife, a virtual reality world on the internet. 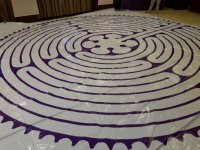 Our labyrinth is a 3d interactive landscape that users (avatars) virtually walk and experience. 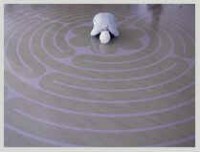 Designed as a guided journey for reflection, stillness and integration. As a non-profit community we explore creative and therapeutic expressions emerging within this medium. Visit us by signing up (free) at secondlife.com. Subscribe to AngelGatelive.com to follow and contribute to latest developments. Our universal labyrinth is accessible via signing up free to Secondlife - a virtual community-on the worldwide web. So you need use of a computer, internet connection and curiosity! 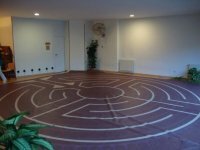 3d computer generated classical Cretan labyrinth experience. December, week-ends and Fridays - January, February, March, April and 1st week of May, open every day from morning till noon. Currently closed during the winter season. 42.09 S° Lat. ; 71.54 W° Long. 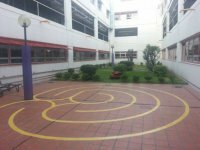 This is a Veriditas Legacy Labyrinth in The San Martin Park, at the corner of Patria and Rivadavia in La Falda. 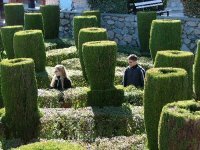 Situated in the El Descanso park - a tourist attraction with beautiful parks, museums and a famous hedge maze. 30 55 S° Lat. ; 64 30 W° Long. Open air sculptural museum - open for special events, such as solstice, full moon, and other festivals. 32 S° Lat. ; 69 W° Long. We are in Argentina and also in USA. We offer workshops in Europe and South America. Located in the historical center of Gyumri, the cultural city of Armenia. 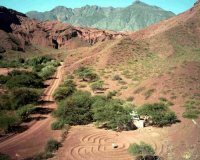 The labyrinth was made by local stone masters with local red basalt and black tuff stone from the Shirak region. 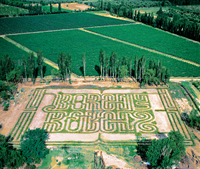 Exact replica of the Chartres Cathedral labyrinth. Built of stones, based on the Chartres labyrinth design. Turn left into Kangarilla Rd and immediately left down Liddyard St, to bottom, turn right along Railway Terrace, just past childrens playground. 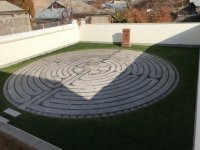 This labyrinth was developed as a Community Arts project funded through Onkapringa Council in the Southern Wine district of McLaren Vale. 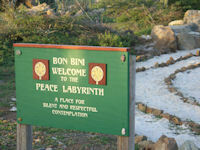 World labyrinth Day - Walk as One at 1pm on 2nd May 2009 - with Cedar Prest, Veriditas Labyrinth Facilitator.